Privacy: We dont collect any data! 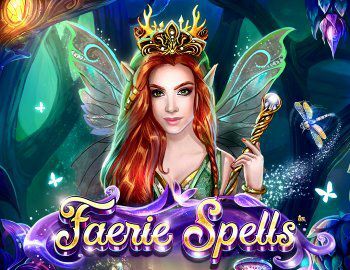 The Faerie Spells slot from Betsoft is an online casino game where you have to uncover the secrets of the undergrowth. Play Faerie Spells and see woodland spirits brew potions in the shadows, and any toadstool can hide a hoard of treasure. A traditional alternative to modern fairytales, the symbols in Faerie Spells paint the natural world as a place of uncharted wealth and wonder. Faeries and pixie princesses are joined by wild, green-bearded tree guardians, will o’ the wisps, and glowing, magical trees. The ruler of the realm, the Faerie Queen, can conjure two different features: her aura causes toadstools to reveal their riches, in the form of multiples of the player’s bet; and three or more of her royal symbols triggers the unique jackpot game.